‘Section’ arrived at the Mayfair-based outfit at the start of the 2014/15 campaign, after seeing out a joyous breakthrough season with Mpumalanga Black Aces. The 26-year-old, however, found the going tough and managed just five starts before falling out of favour in his first year with the Soweto giants. In the last two seasons, Qalinge made a paltry nine starts in all competitions as he endured a frustrating time on the sidelines as the team also went through a massive slump. However, the speedy winger has been handed a lifeline since coach Micho Sredojevic’s arrival and is relishing his playing time of late, as he regains his confidence and form. 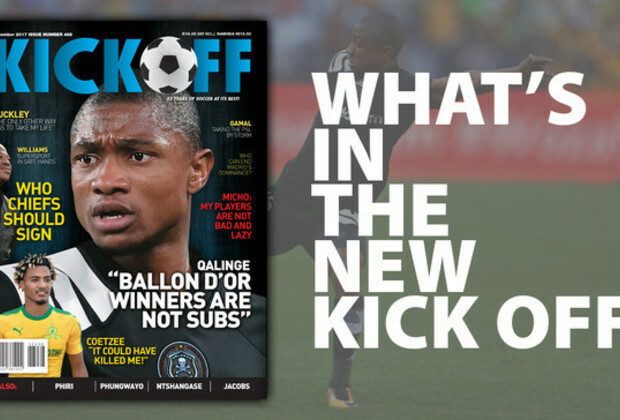 “People know my situation – I wasn’t playing for a very long time,” said Qalinge in the latest KICK OFF Magazine. “This season is the first season where I’m playing many games consecutively. “My confidence is back and it helps to be playing so many games. When you play six, seven or eight matches in a row, then it happens naturally that you get your confidence back because you are used to playing. Qalinge, who has gained plaudits for his performances this season, also emphasised the importance of playing regularly because substitutes don’t “win the Ballon d’Or”. “When your appearances are few and far between, and sometimes you don’t play at all, it’s not easy to be at the peak of your game,” he added. The diminutive attacker also talks about his trickery, Bucs' improvement under the new technical team as well as the effects of Oupa Manyisa's move to Mamelodi Sundowns in the magazine. Check out this feature, and much more, in the December edition on sale NOW! Or DOWNLOAD a digital copy of KICK OFF Magazine here!